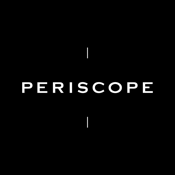 Periscope is an app magazine with a focus on old school storytelling. Using cutting edge technology and design, we tell multidimensional stories about artists and makers whose ideas and approach are unconventional and groundbreaking. - Tim Hetherington Interview: "The Beauty of Mundanity in War"
- Best Made Co. :"It all Started With an Ax"
- Andrew and Peter Sutherland : "Even In The End"
- Photo Essay by Grace Villamil and Yumiko Sakuma, "20 Americans, Four Years Later"